This is a painting of a fishing trawler that is used in Kedah, a northern state near to Thailand. The registration number (KNF) denotes the state which issues the fishing licence, which is Kedah. This is a high deck trawler that is used in deep-sea fishing and as you can see, the trawler is going out to sea while another trawler heads upriver (at right). 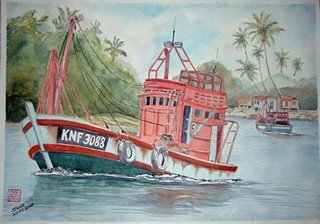 Because of the strong waves along the Kedah coast (facing the Andaman seas), trawlers such as this, is kept deep up river and inland to protect them from the elements.